Look at this picture and tell me what you see. Yes that’s right, you do see a proud mum with her cute little boy in a beautifully crafted, newly made sling on its maiden voyage. Now ladies and gents, a question, what does pride come before? No you eager little beavers, it does not come before a fall. At FTC pride comes before finding out that your delicate little flower of a son is allergic to the material you have just spent the last week, and several sewing needles, crafting into a perfect new sling for him!!! 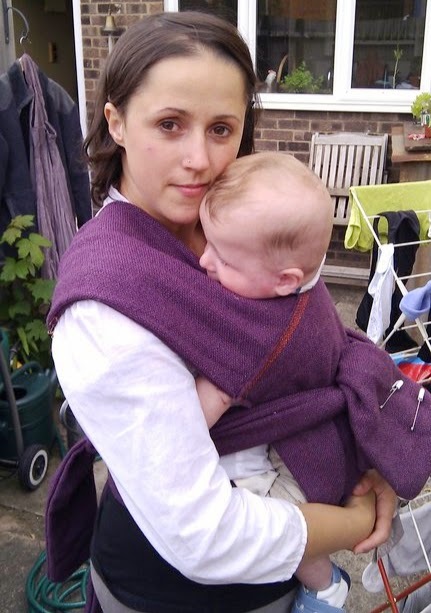 This sling was my magnum opus, so you will excuse me if I am rather less than amused by Alfie right now. I fell in love with a type of sling called the Mei Tai while we were at the Big Weekend and wondered over to a sling stall to find out how I could go about getting one for Alfie. As an aside, I know we already have a sling, which I love, but frankly it just isn’t working for us anymore. The material is stretchy and Alfie is a chunk monkey and the end result is the poor mite gets a vigorous back massage from my knees whenever I use it. Right so I'm at the Big weekend , and I go up to this smug looking sling seller who’s child is “perfectly at one with the universe” in this sling (I'm sure he wasn't but they had that look of smugness about them) and I thought I’d quite like a piece of that pie, rather than the rabid Jabberwocky my son seems to have become recently, and asked the man how much his Mei Tai cost. He looked Keith and I up and down, smiled serenely with just the merest hint of smirk and said “sixty pounds”. No fella, sorry, I didn't ask to buy your kid, how much for the sling? Y’know that square of material with 4 simple cloth straps you tie around you? The one I could make for far less than that myself? Sixty quid? Does that come with a free holiday perchance? So no Mei Tai for me. But I wanted one, I REALLY wanted one because I just knew that it would suite Alfie and I perfectly, so we asked a lovely friend of ours who runs an upholstery business and he found some old material he could give to us and sent me off a happy bunny to make my own Mei Tai. Unusually for me I was determined to do things properly. I printed off some rules, got a measuring stick and a pen and measure twice before cutting once. I pinned the seams – I know, it’s crazy talk – ironed them flat and sewed them slowly and carefully. I went through 5 needles in total, because the material was so thick and luscious, but it didn’t matter because this was going to be the KING of Mei Tai. This was going to be the Mei Tai that those £60 feckers aspired to be!! I had some issues getting the straps onto the main panel the material was so thick, so back to our friend I went and he ran them up for me in seconds. I think it’s fair to say I skipped home after that and put the final lining touches to the sling ready to go on its trial run yesterday. I don’t mean to labour the point here, I just want you to understand the emotional investment that had gone into the smile you see on that face. “Is he getting a rash on his cheeks?" Right about then my head exploded because what my darling husband had in fact made impossible to ignore by his question was that yes, Alfie did now have a glowing rash on his cheeks, and they were very obviously caused by the straps on the sling. So today I am sulking, and no amount of super cute family cuddle time before I Ieft will erase the basic tenet that I just spent a week making a totally useless sling. Now bugger off the lot of you, I have worms to sit and eat. Check Alfie! I just propped him up in the corner of the sofa and he sat himself up all on his own! Gotta dash - he's collapsed! Ah my son, with sitting as with all things in life: The line between supreme success and steaming heap of turd is so thin. Keith and I because we get enough sleep to function the next day. Alfie because we get enough sleep to function the next day. Recently however the little man has needed some extra cuddles day and night, due to my new most hated thing on earth – teeth. Incidentally, you have to spit that word through a clenched jaw round our house. No exceptions. Point being, he is tending to wake in the night with sore gums wanting cuddles and back rubs in order to drop back off and in all honesty we should have cottoned onto the fact that this was most easily done if he were in the same bed with us. Actually, we were really, REALLY slow on the uptake where co-sleeping was concerned. Light finally dawned for me at the Big Weekend when I listened to a lovely lady called Kate Evans run through this part of her book on breastfeeding. Obviously the feeding part doesn't really work for us, but the trips to soothe? The Tai Chi manoeuvres to get little person onto mattress only to have them wake back up the second your foot hits the hall carpet? See we could have ended that misery LONG ago. Clearly we are klutz. This morning the little man woke at 4. If I had written that even a month ago it would have meant that I was sitting here typing through tears. Today though, I 'persuaded' Keith to go and collect our little squeaky toy (his new “I’m awake, come and get me” noise) and bring him in with us. Read on at Dooce and it might strike you that this was nervous laughter in part because Heather’s youngest daughter Marlo has developed since that post – and if Alfie is heading the same way, I'm on a one way flight to Rio ASAP! Anyway, into bed he came, and sure enough the problem was his teefs. A dose of Rescue Remedy and teething gel later and guess what, we were all snuggled up together catching a few more Zzzs. Absolute and total bliss. 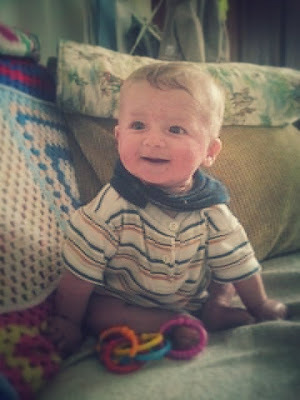 Is there anything more lovely than early morning cuddles nuzzled into a sweet smelling baby and a gorgeous hubby? Well he's only gone and done it!! The long awaited addition of Alfie vids to YouTube has begun! This little gem is one of my favourites, Alfie suddenly lost his pea one day and all his raspberries got stuck. If you go to YouTube you can subscribe to Keith's channel which will hopefully let you know every time he uploads a new video!! OK so I’m going to gloss over the length of time I’ve been away, and merely suggest you ask my husband why it is so difficult for him to get round to uploading photos and video to the interweb so I have something interesting to show you. Anyway, instead, you get to just read some exciting words and use your imagination. Yeah it’s that dusty thing out back of your brain last used to supply dolls with hot steaming tea / turn a cardboard box into a racecar (delete as appropriate). Anyway, item 1 on the agenda ... Ina May Gaskin. Oh yes, Ina May frickin GASKIN ladies and gents, who is one of these itty bitty people who can fill a whole big room with an instance sense of calm, and wisdom and, all the other things I might one day possess when I grow up. We were at the NCT Big Weekend which was just such a thrill for me. A whole weekend of talking to other women about birth stuff, and seeing babies in slings all over the place, most of them passed out with their heads at impossible angles, others being breast fed without any sense of having to move discreetly into a dark corner to avoid the embarrassment of others. Anyway I digress, top of a very exciting list of speakers was the lady herself and sitting in the lunch hall on Sunday with Keith and Alfie, I was just a little bit excited, and possibly distracted as well. We were busy solving the issue of how to give a whole banana to a boy who (understandably) isn’t too keen on slime as a food texture (despite eating some of the goop during “Goop Time” at the crèche). We finally figured out that bananas come ready installed with the solution (the skin) and that just cutting down the skin to half way provides a perfect handle for a now highly enthused little boy (a little too enthused actually, there was some gagging). Feeling triumphant, I went to collect up the excess slimy nana and (can you see where this is going yet) lost grip, firing a piece out into the general mêlée of the hall. Right into a lady who was walking not a foot from our table at the time. A lovely lady with grey hair and a lovely green jacket and OH MY GOD IT’S INA MAY!!! I just fired a piece of banana at Ina May GASKIN. To be fair I don’t think she even noticed, she just sailed serenely on towards the hot food bar. But seriously, Ina May if by some weird quirk of life you might ever actually read this, I’m sorry. And on the subject of crèche stays, it was a roaring success for young Alfie B (as the staff christened him) who came away from the weekend with a certificate thanking him for entertaining the staff, and for enjoying music time. If Keith ever tames his new mobile, there will be a video on ewe choob which will make infinite sense of both those statements. One of the things I found out while I was away was this and frankly I have few words to describe how poor I find this. Ina May’s talk was very much about how the US is following the Brazilian maternity model which in private hospitals has a C Section rate of 95%. Can we just pause for a moment to really take in what I just said. 95% of babies are cut out of their mothers in urban Brazil. That is just so wrong on so many levels I’m not even sure where to start. Anyway, I really hope the UK can stop and think long enough to realise that the US are not a great role model in this respect and make the choice to move in a different direction that provides healthy choices for all birthing women. Moving on I have other news. We went to see the dermatologist about Alfie’s skin the other week and predictably we were given some hydrocortisone creams. Just as predictably, they are doing an amazing job of fixing the little fella, which is great. The important thing for both Keith and I, though, was that the doctor (who we had researched and specifically requested to be referred to because of her work in paediatric dermatology) listened well to the history of Alfie’s condition and agreed to his being allergy tested as part of an holistic approach to tackling his condition. Huzzah! He goes back pretty soon to discuss ongoing management of his flare ups, so fingers crossed the next meeting is as positive as the first. Incidentally, there are some new photos in the album, but if you want to keep up to date with the Daily Bumbo (as it has now become), start badgering Keith on Facebook. In fact, badger him anyway, he might actually get round to uploading those videos!! Oh and as a final little snippet of juicy gossip, I got an honourable mention in a writing contest recently. Check out Rixa's blog if you don't believe me!